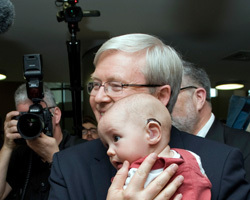 On Monday, Prime Minister Kevin Rudd announced the first new Australian Innovation Partnership – the Medical Technologies Innovation Partnership – which will be headquartered in Macquarie Park. 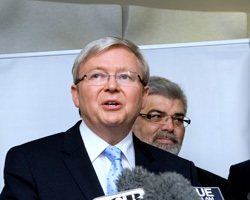 Mr Rudd, Senator Kim Carr, and local candidate Jason Yat-sen Li made the announcement during a visit to the Australian Hearing Hub on Macquarie University’s campus.The group toured the Australian Hearing Hub’s key facilities, including the anechoic chamber, Magnetoencephalography (MEG) labs and liquid helium recovery system. The Medical Technologies Innovation Partnership was established following an expression of interest by a large consortium of industry, academic institutions and government, including core partners Cochlear Limited, Macquarie University, the Bionics Institute, Flinders University, STC, ATP Innovations and the Westmead Research Hub. The new Australian Innovation Partnerships will build national networks of partners from different sectors, with the aim of helping businesses and researchers to collaborate, share knowledge and deploy technology, enabling translation of research into commercial outcomes. These industry-led partnerships will tap into our world-class science and research capabilities to increase the competitiveness of Australian industries and create more jobs.